Everything is awesome for Lego. The Danish toymaker has broken into the world's top 100 most valuable brands for the first time. 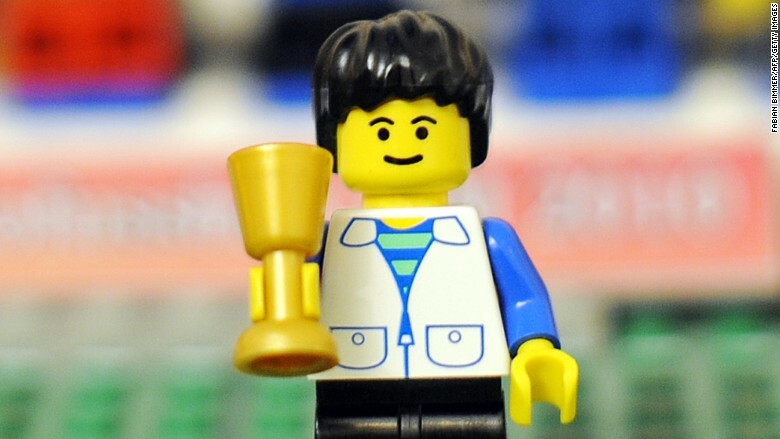 Lego is now the 83rd most valuable brand globally, according to research by the Interbrand consultancy. Interbrand ranks Apple (AAPL), Google (GOOGL) and Coca-Cola (COCA) as the top three brands. It considers three main criteria when compiling the list. Besides the financial performance of branded products, it also looks at how the brand influences customer choice, and whether it can push up the price of a product. Lego's entry into the top 100 means the company has jumped ahead some of the world's most recognizable brands, such as Nokia (NOK), Gap (GPS), and Pizza Hut, owned by Yum! Brands (YUM). "Lego is a brilliant example of a legacy brand that is keeping its proposition relevant by evolving the experience," said Rebecca Robins, a director at Interbrand. The maker of the famous plastic stackable bricks became the biggest toymaker in the world in terms of revenue and profit in 2014. "Lego is clearly rethinking its role, and migrating from a toy brand to a fully fledged entertainment brand, while staying true to its DNA -- and employing technology as a powerful means, not as a superfluous end," Robins said.